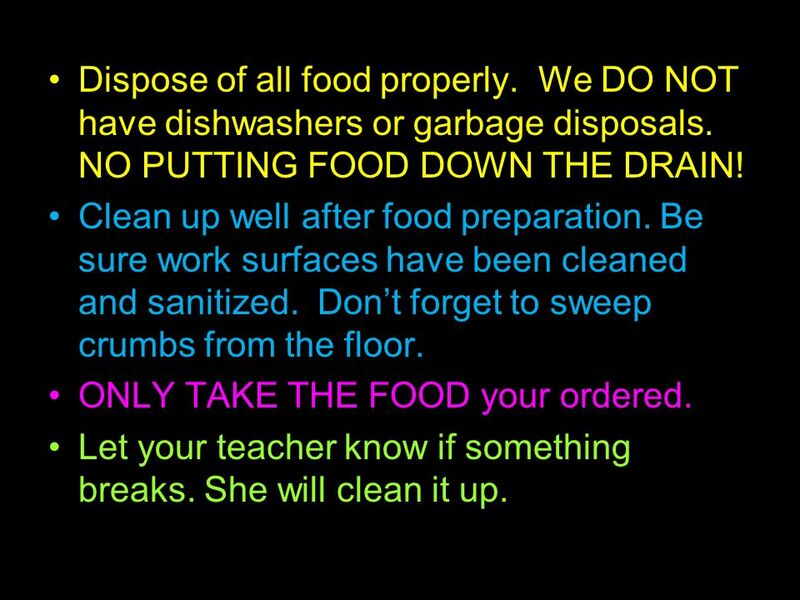 Kitchen Cleanliness and Safety Guidelines!. Wash counter tops, tables and other work surfaces before you begin cooking. You never know what was left there. 1 Kitchen Cleanliness and Safety Guidelines! 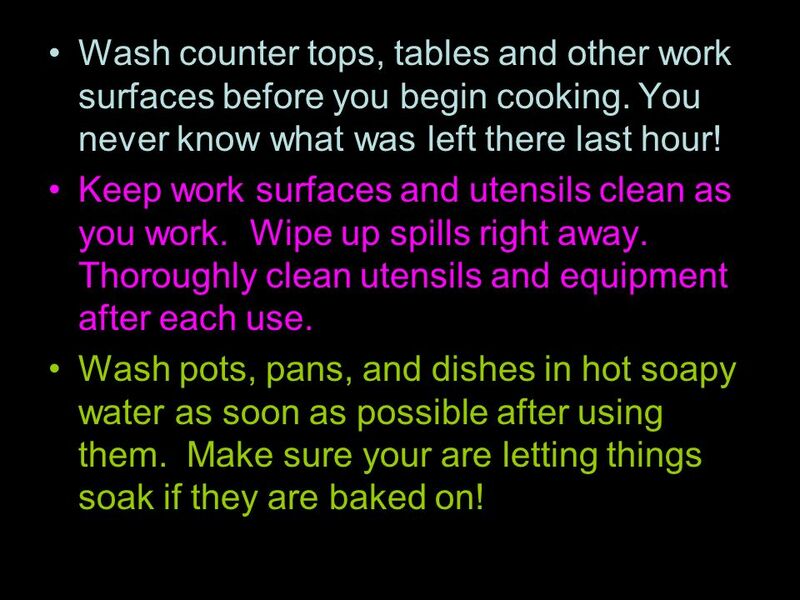 2 Wash counter tops, tables and other work surfaces before you begin cooking. You never know what was left there last hour! Keep work surfaces and utensils clean as you work. Wipe up spills right away. Thoroughly clean utensils and equipment after each use. Wash pots, pans, and dishes in hot soapy water as soon as possible after using them. Make sure your are letting things soak if they are baked on! 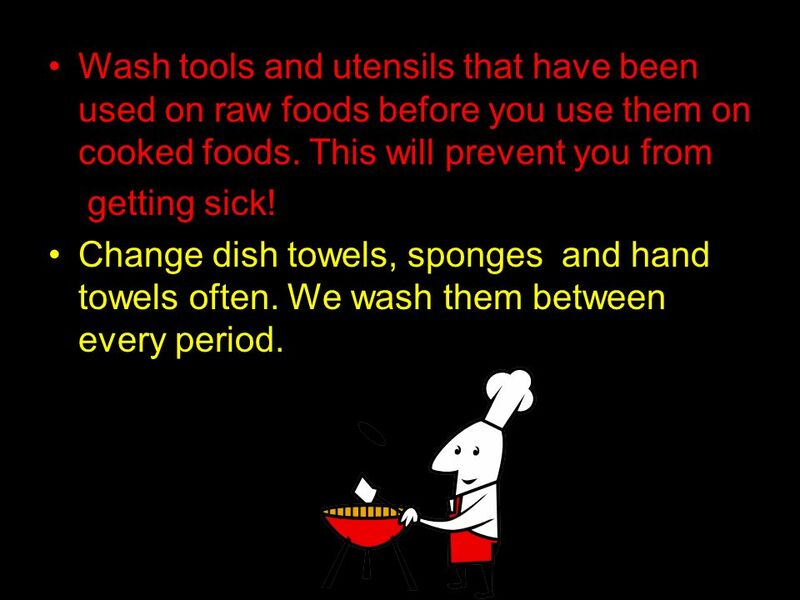 3 Wash tools and utensils that have been used on raw foods before you use them on cooked foods. This will prevent you from getting sick! Change dish towels, sponges and hand towels often. We wash them between every period. 4 Dispose of all food properly. We DO NOT have dishwashers or garbage disposals. NO PUTTING FOOD DOWN THE DRAIN! Clean up well after food preparation. Be sure work surfaces have been cleaned and sanitized. Dont forget to sweep crumbs from the floor. ONLY TAKE THE FOOD your ordered. Let your teacher know if something breaks. She will clean it up. 5 There will be no roughhousing/ running/ hitting. We are using boiling liquids and knives. Misbehavior will not be tolerated and will be punished in an appropriate fashion. It is your job to keep this room safe and clean. If you are not all doing your job with this, people risk injury or illness, and we will wreck our brand new room! Please be careful and ask questions if you need help! 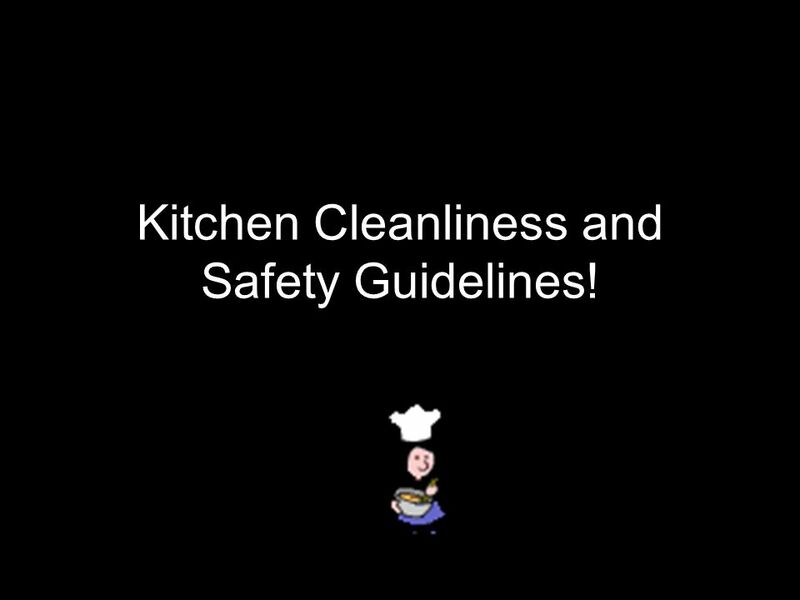 Download ppt "Kitchen Cleanliness and Safety Guidelines!. Wash counter tops, tables and other work surfaces before you begin cooking. You never know what was left there." Kitchen Rules! 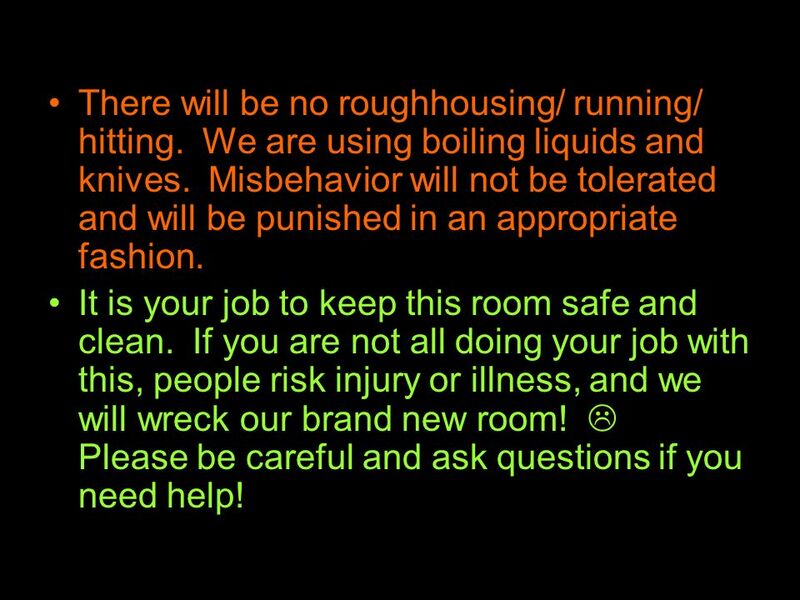  Please follow these rules to have a fun as well as safe and sanitary lab! Thank you!! (By not following these rules you are subject to. What you need to know to be safe in the FACS classroom. Lab Management Information. Before Starting a Lab:  1. Wash hands with hot, soapy water for 20 seconds. Rewash whenever necessary.  2. Long hair must. It’s so important!!! Here are some words that you should know….. (1)  Safety—developing habits to avoid accidents and keep people healthy—Most kitchen. Sanitation Procedures Entry-Level Training Module I Lesson One. If the practice is dangerous, explain why the practice is dangerous. Section 8-3 The Flow of Food. Child Safety – Kitchen Safety By : Dalton Parker. The University of Georgia Cooperative Extension Service. Foods 1, unit 1 Safety & Sanitation Electricity & knives Electricity – Use dry hands and keep cords away from water. Do not overload circuits or use. Safety Thumbs  Put your Thumbs Up if it is SAFE.  Put your Thumb Down if it is NOT SAFE. LAB GUIDELINES C ooking C orrectly for C redit Or Ways to make your life happier in foods class.